Charlie McCoy is set up by small-time crook Mo Baker to be the fall guy for a burglary on mob boss Phil Adonis' home. It doesn't go according to plan and he ends up shooting Mo dead. Unable to see any other way out, Charlie goes on the run with his ill-gotten gains and, unexpectedly, his teenage daughter. He discovers the bag from the burglary doesn't contain the heap of cash he was expecting; it actually contains Phil Adonis' 'sensitive' financial information on a bunch of CD-ROMs.... and Phil's coming to get them back with his band of psycho henchmen! Charlie McCoy is the quintessential lovable rogue. He's done some bad s**t and done his time. He's determined he's not going back inside for another stretch. His relationship with daughter Amy is complicated. The divorce from ex-wife Carol and absence from Amy's life have left her with a far from perfect view of him. During their time on the run, their relationship is fully explored and this, for me, is what makes the book such a good read. There's plenty of action, the story flows well and the pacing is excellent. The author has a talent for writing that is distinctly evident. My only quibble is the unprofessional looking cover art which doesn't do the book justice. Sort the cover and the book really would be the whole package. My thanks to author Christopher Wilsher for providing a copy of this book. N.B. Since writing this review, the book cover has been updated. What do you value when you have nothing left to lose? 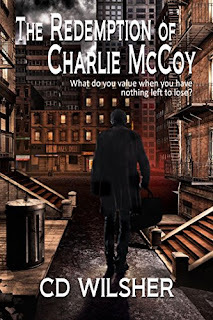 Charlie is set up to take the fall for a burglary of a powerful mob boss’s house. But he gets the drop on his partner, and he manages to escape with his life and a bag full of CD-ROMs that incriminate some dirty politicians. Now both the mob and the FBI are in hot pursuit. He’s on his way out of town when his ex-wife unexpectedly saddles him with Amy, his smartass, know-it-all thirteen-year-old daughter. He barely knows Amy, and there are things he’s not telling her, such as how he makes a living; but she seems to understand Charlie better than he does himself--such as how he could be better than what he is. When the mob tortures and murders his ex-wife in an effort to locate Charlie, he realizes he’s all that Amy has left. Now time is running out for him to engineer an escape while insuring neither of them ends up dead.